Celebrate the Haitian Heritage Month with a special invitation from Mayor Messam of the city of Miramar and the Haitian American Chamber of Commerce on Sunday, May 5, 2019 at 6:30 PM at the Miramar Center for the Performing Arts. An incredible, family-friendly performance will put you in the spirit to show your colors and brandish your flags to celebrate your heritage! 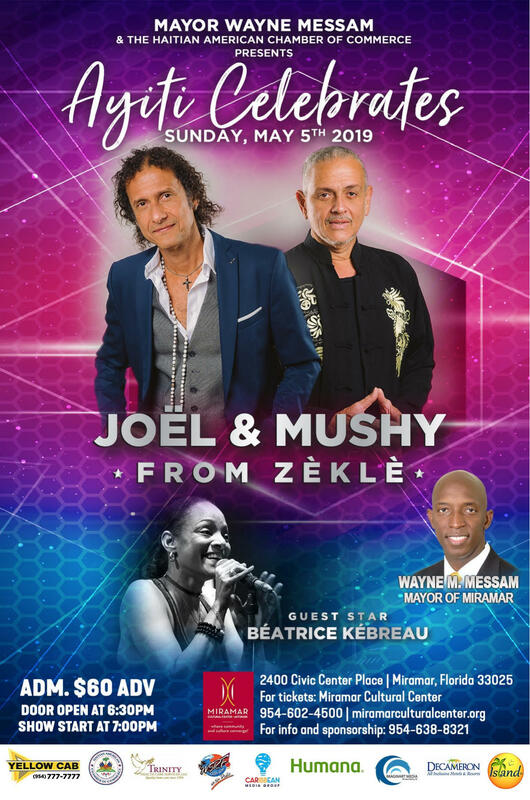 Head down to "Ayiti Celebrates” 2 edition with duo Joel and Mushy Widmaier as they perform Creole Jazz classics with a twist of roots, blues and rearranged hits from the group Zèklè in a stew of traditional Haitian roots and World music.